I would like to apologize for the serious lack of blog for the past month… the end of the trip was absolute madness, and then suddenly the semester was over! Excuses aside, I cannot believe that I have successfully completed a semester abroad in Vietnam, made 11 new amazing friends, turned 40 page paper on urban agriculture in Hanoi, and did it in an audai. At the moment, I am sitting at a beach-side cafe on the island of Phu Quoc with two other girls from the program. We weren’t ready to leave south-east asia, and so we’ve traveled for a week in Cambodia and have decided to end our travels on an island paradise… life is so hard. These last couple blogs are going to require a walk down memory lane since I want to make sure I blog about my trip to Sapa, my final research project, and our trip to Cambodia. 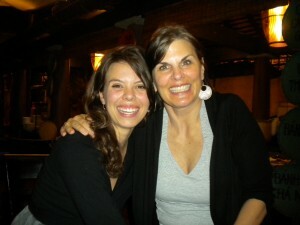 I was so fortunate to have my aunt Karen come visit me in Hanoi while she was in Asia on business. It was so wonderful to feel the comfort of family while in Vietnam. 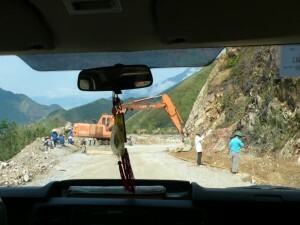 We gave ourselves a little vacation to Sapa for about 3 nights. 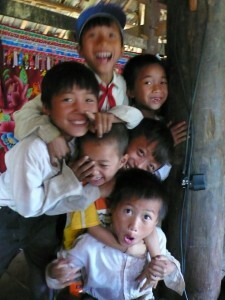 Sapa is a town in the northern part of Vietnam, close to the Chinese border. 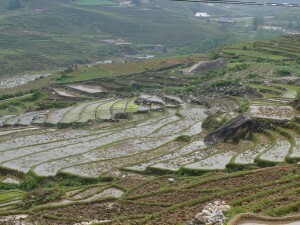 The overnight train takes you from Hanoi to Lao Cai, and then a short bus ride to the town of Sapa. Sapa was significantly cooler and tucked into what looked like asian alps, both lush and green but jagged, fierce, and huge. Sapa has attracted tourists from the city since the time of French colonization for its cool weather, but also for the staggering beauty of the culture of the ethnic minorities that live in the north. 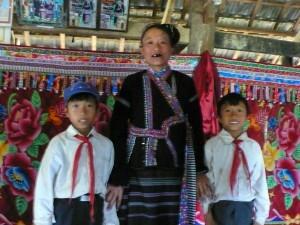 The largest group is the Black H’mong, but there are about 50 ethnic minorities that live in the north. I still cannot even describe the beauty of the area… enjoy the pictures, words simply aren’t enough. The best part of the trip was our guide. We were told to request a local guide when looking for someone to take us around the area. 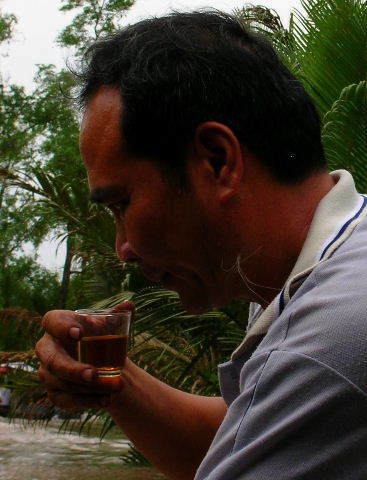 “Chai,” which is her Vietnamese name, met my aunt and I at our hotel in a traditional black h’mong outfit of black velvbet cloth wrapped around her ankles up to her knees, a black skirt, and a beautifully, handwoven jacket. She is only 20, and has been guiding tourists since she was 18. Her English sounded better than mine… She is the seven out of 10 kids and her family lives off of the rice they grow and what she makes as a guide. We passed her house on our drive out to the Thai village. If I had a view like hers, I don’t know if I would ever leave home. Growing up in the San Juan mountains, I thought I was used to white-knuckle drives through the mountains. I was wrong… this will make red mountain pass look a walk through the park. 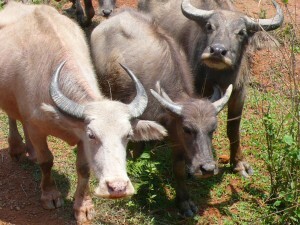 We walked through tea farms and past water buffalo to our first village, a Thai group. It was hard to say if they liked us tourists visiting, so we tried our best to respect their space and stay out of the way. One mother invited us into her stilted house, and I am so grateful she did because it was one of the best moments on the trip. The Thai women blacken their teeth, however the government just made it illegal for girls under 18 to blacken their teeth, so only the older women do so. These women are also known for their brightly colored weavings. Their looms are built underneath their house, and set up between the stilts. They also have silver ear plugs that look like coins which they wear with flowers in their ears. Karen and I felt like complete shmucks in compared to the beautiful way these women carried themselves. Her house was filled with young boys with the brightest laughter and sweetest smiles. My trip has shown me time and again how children have the amazing ability to pay the cultural walls that we have built with age and history no mind. What wonderful people to share laughter, tea and photos with complete strangers. The trip to the north was absolutely amazing, and one of my favorite experiences—but it is also the part of the trip that leaves my stomach churning. Words like exploitation, cultural preservation, zoo keep ringing through my ears. 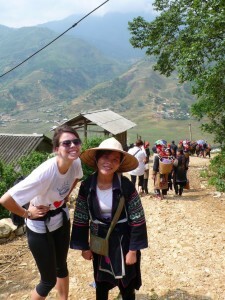 We had a lecture in the beginning of the semester on sustainable tourism where we talked briefly about Sapa. There is a lot of government to preserve their culture and livelihoods as it brings in lucrative tourism. But this cultural preservation is so delicate since these changing times are undoubtedly going to have an effect. But I couldn’t help but think about the centuries of colonialism and globalization that have had their effects on the H’mong and all the other tribes in the area. And still, their identity as H’mong remains so strong. I did find out that our program is pairing up with an Sociology professor from Hanoi, Douglas Jardine, for the next semester. It should be more academically focused on the Black H’mong people as well as what sustainable tourism means in the context of Sapa. This area is a very special place, and one that demands their visitors be careful, conscious, and aware.